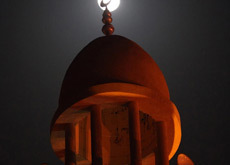 The organization representing the world’s biggest grouping of Muslim majority nations is seeking to attract more overseas investment by offering the first Shariah compliant stock index from its 57 members. The Organization of the Islamic Conference based in Jeddah hired Standard & Poor’s to start an index of about 50 of the most traded stocks in the first quarter of 2011, Huseyin Erkan, the Istanbul Stock Exchange’s chief executive officer and coordinator of the initiative, said on November 8. 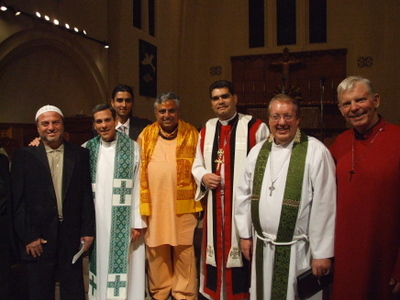 In a remarkable interfaith gesture, Nevada (USA) celebrated its 25th Annual Interfaith Thanksgiving Eve Service on November 24 evening at Trinity Episcopal Church in Reno with various religions/denominations coming together to pray. Christian (various denominations), Muslim, Hindu, Buddhist, Jewish, and Baha’i prayers and other readings were held on the occasion giving thanks to God. Participants included Episcopal rector Stefani Schatz, Buddhist priest William Bartlett, Jewish rabbi Myra Soifer, Roman Catholic readers Joe Bell and Rocio Grady, United Methodist pastor Judith Bitter, Muslim imam Abdulrahim Barghouthi, Hindu leader Rajan Zed, Church of Jesus Christ of Latter-day Saints elder Nicholas Frey, Baha’i elder Roya Galata, Robert Petrovich of International Community of Christ. Jasmin Ullah sits on her bed in her room at home in northern Virginia and tucks her feet underneath her as she starts to describe what it is like to be a 17-year-old, headscarf-wearing Muslim in the United States. “People expect me to be quiet because I wear the hijab,” she says, and then confesses with a loud laugh that she is anything but quiet. Jasmin, one of five children in the Ullah family, was born in the US a few years after her parents emigrated from Bangladesh. Articulate and vivacious, her tone becomes more serious as she describes being tripped up in the corridors at school or being called “towel head” by fellow students. “We were expecting a backlash around the anniversary of 9/11 – but this year it’s been enormous,” says Sarah Thompson, communications director of the Indiana-based Islamic Society of North America. 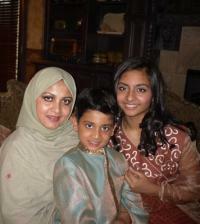 But finding a unified voice and a clear identity is hard because of the diversity within the Muslim community itself. Emily Miller, an energetic elementary schoolteacher in Des Moines, loves to sing. So one recent morning, after her first-graders put away their backpacks and sharpen their pencils, she sits them in a semicircle and sings a variation of a song she learned growing up Catholic in southwest Iowa. It’s a typical morning at New Horizons Academy, a private day care and school at the Islamic Center of Des Moines. But for Miller and Jennifer DeMuynck, classes here are like nothing they’ve experienced before. While more than a billion Muslims around the world celebrated Eid today, those gathered in the Al-Masha’er district of Saudi Arabia proceeded with their hajj rituals – throwing pebbles at vast pillars, shaving their heads and sacrificing animals. Shaving the head, or halq, is a fundamental act for all male pilgrims during the pilgrimage: Muhammad is said to have prayed three times for men who removed all their hair and only once for those who trimmed it. The slaughter of an animal – qurbani – marks Abraham’s willingness to sacrifice his son Ishmael at Allah’s command. The ministry of hajj proudly announced earlier this month that more than 100,000 Somali sheep were on hand to cover the high demand for sacrificial animals, adding to the 400,000 waiting in Jeddah and the extra million already being imported. 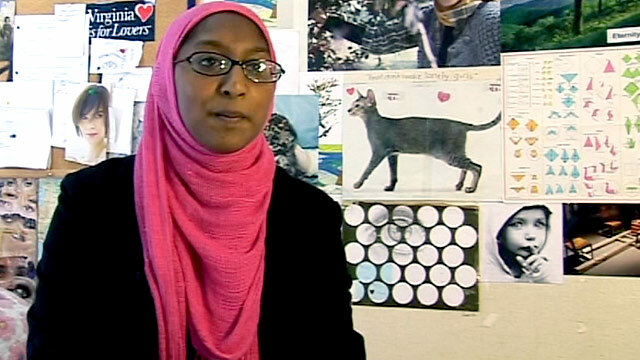 (RNS) When the subject of the proposed Islamic center near Ground Zero came up in Fahina Chowdhury’s government class recently, the high school freshman at Oklahoma City’s Classen School for Advanced Studies, spoke up. “As a Muslim American, and as the daughter of someone who was killed on September 11, I knew I had to say something,” Chowdhury, 14, said. Chowdhury told classmates that Muslims condemn terrorism, and that the 9/11 terrorists killed people of all faiths. 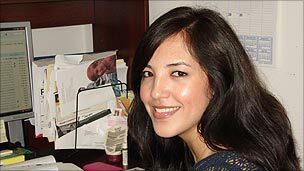 She didn’t reveal that her father, Mohammad S. Chowdhury, a waiter at Windows on the World restaurant on the top floor of the World Trade Center’s North Tower, was a 9/11 victim. Dealing with school and trying to be “normal teenager” was pressure enough, and Chowdhury didn’t want the added attention and sympathy.